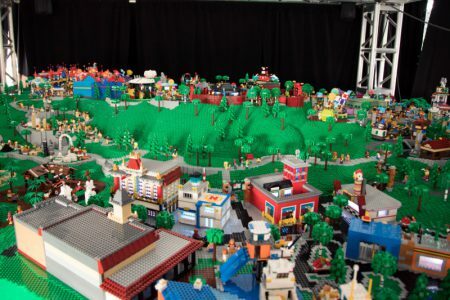 Legoland has reportedly unveiled a 10-foot LEGO model of their newest, biggest, brightest, bestest theme park set to to open in Goshen, New York in 2020, according to a story on Inparkmagazine.com. You know, so they won’t have to travel to Carlsbad or Florida to get their Legoland fix. Not only that, but this new park (sorry Carlsbad) will be parent company Merlin Entertainments’ “largest investment in a single park to date.” Ouch. For the rest of the story, please click the link. Paul gets up late for his morning watch after a night of no sleep while piloting the SV Bella Luna North toward Baltimore. Lot of open ocean, a couple ships passing in the night, a 64 foot high bridge and a 63.5 foot tall mast, and a long cruise through the Intercoastal Waterway for an emotion reunion with the rest of the SV Bella Luna. Paul wakes up in Turks & Cacos to find that the squalls passing through during the night had balled up the anchor chain. There were other issues as well. But the crew’s time was not all spent fixing the SV Bella Luna. Nope. They got in some fishing, and better yet got into the beautifully clear, warm water of the Turks and Caicos. Paul, without his family, takes the SV Bella Luna out into the open ocean on the way North to Baltimore with a new crew. On the way they have some engine trouble, are joined by a pod of dolphins, and eat what Paul describes as the worst meal of the voyage. The crew of the SV Bella Luna survive the winter and with spring coming in they head back to Tortola to sale her back north for the summer. If you’re enjoying following along on this Carlsbad family’s journey, click here to check out the SV Bella Luna store. There you can snag hats, shirts, and other goodies with the SVBL logo on it and help support the trip. Paul and the crew look for a big berth for the 24 foot beam, 42 foot long SV Bella Luna, celebrate Bella’s 10th birthday, and head south to Tortola, British Virgin Islands to check in on the boat itself. This whole sailing thing is much more complicated that it seems. Click play and you’ll see what we mean.